Those are two characters from a series of books by Suzanne Tate. They are pretty good, and geared toward children. I have read one of her books, Skippy the Scallop, to kindergarten classes the last two years. Its one of those things I try to do from time to time. But I digress. Crabby and Nabby are blue crabs. And that relates to my research how? 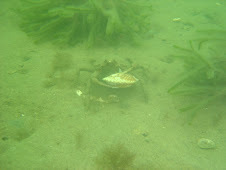 Well I decided a logical step in the progression of my research was investigating blue crabs as scallop predators. This isn't new. What is new, however, is that blue crab abundance has exploded on Long Island. Now, NY is certainly within the range, but toward the northern limits of their range. With warming temperatures, the blue crab populations are growing here on Long Island. 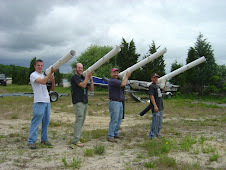 This can create a problem with the scallop restoration efforts here. Why? Well, blue crabs are voracious bivalve predators, and they recruit to submerged aquatic vegetation, and especially seagrasses like Zostera marina. 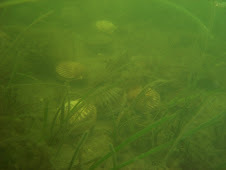 These are the very same habitats to which scallops recruit. So it is entirely likely that the increase in blue crabs in NY will have a significant impact on bay scallops, based on the available literature. That being said, no one has investigated blue crabs in Long Island. So one step of my research is now investigating where the blue crabs are recruiting in a south shore lagoon estuary, Shinnecock Bay. I have been doing this for the last two weeks, but will continue to monitor 3 times a week through October. At these same sites, I am monitoring bivalve recruitment to see if indeed scallops and blue crabs are recruiting to the same areas. Then I will do some mesocosm predation experiments with varying complexities and investigating the canopy of vegetation as above bottom refuges for scallops from the swimming crabs. All in a days work!